RPM recently introduced a new, more effective digital optimization, reporting and cloud data storage solution for Client-Partners. The new tools provide each client with customized dashboards and reporting tools for real-time data about consumer and campaign performance. This data will be used to inform real-time optimization decision-making – from the initiation of a holistic digital campaign all the way through optimization. RPM’s brand new suite of business intelligence tools are intuitive, agile, real-time, and come complete with a cloud data storage solution that provides the most granular view of a client’s digital campaign’s program performance. In addition to the tool, clients receive monthly communications containing a link to the custom as well as additional reporting (such as executive-level briefs) that may be helpful to marketing teams. 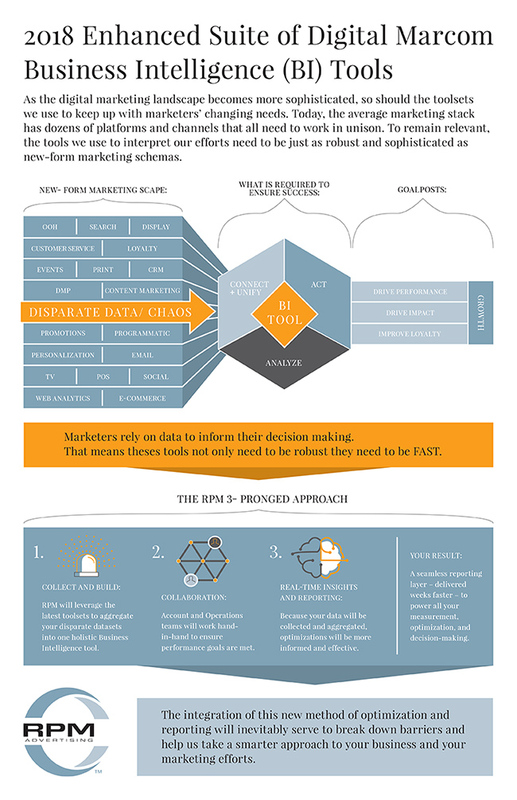 To learn more about this enhanced suite of digital marcom business intelligence (BI) tools, see the infographic below.